You're ready to own a home. And you think you know the basics involved in finding one, working with a real estate agent, and applying for a mortgage. But buying a home for the first time can be a confusing process. This is especially true if you believe certain myths about searching for and making an offer on a house. 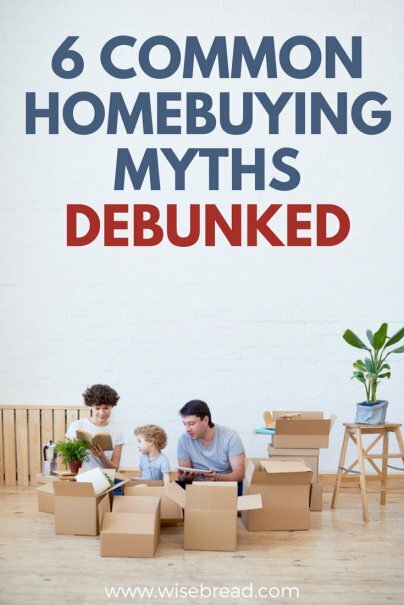 If you want to alleviate some of the uncertainty that comes with buying your first home, it's time you learned the truth about the homebuying myths too many consumers still believe. Actually, if you're working with a real estate agent to buy a home, it's free. Buyers usually don't pay for the work their agents do in helping them find and make offers on homes. When you buy a home, the sellers typically pay the commissions of both your agent and theirs. The funds for this come from the proceeds of the home sale. Applying for a mortgage is another nerve-wracking part of buying a home. You'll pay thousands of dollars to your lender and other third-party providers to close the loan that allows you to buy your new home. But you probably don't need to come up with as big of a down payment as you think. Many buyers mistakenly think that they need to come up with a down payment equal to at least 20 percent of a home's final purchase price. That can be intimidating: A 20 percent down payment on a home costing $200,000 comes out to $40,000 — a lot of money. Fortunately, you can buy a home with smaller down payments. FHA loans, for instance, often require down payments as low as 3.5 percent of a home's final purchase price. You can also qualify for conventional loans with down payments as low as 3 percent. Traditionally, buyers have flooded the housing market in the spring, when the majority of single-family homes and condominiums go up for sale. However, there really is no one time of the year that is "best" for buying a home. You might even find better bargains on homes if you start your search before or after the spring. The traditional 30-year, fixed-rate loan comes with two big positives: The monthly payment will only fluctuate slightly over the life of the loan, and the monthly payment is relatively low because the loan term is so long. However, this doesn't mean that this loan is right for every buyer. If you take out a 15-year, fixed-rate loan, you'll have a higher monthly payment, but you'll also pay tens of thousands of dollars less in interest. If you plan on spending five years or less in the home you are buying, an adjustable-rate mortgage (ARM) might even be a better choice because it comes with lower initial interest rates. There is a big potential pitfall that could scuttle your purchase even after you and a seller sign a sales contract: The home you are buying might not appraise at a value that is high enough. After you and your seller sign a contract, your lender will require that you pay for an appraiser — about $400 to $500 — to determine the current market value of the home you are buying. If that market value isn't at least equal to the money your lender is giving you, your deal could flop. We all hope that the home we buy will be worth more when it's time to sell. And often, it is. But there are no guarantees that the home you buy will appreciate in value, no matter how long you hold onto it.